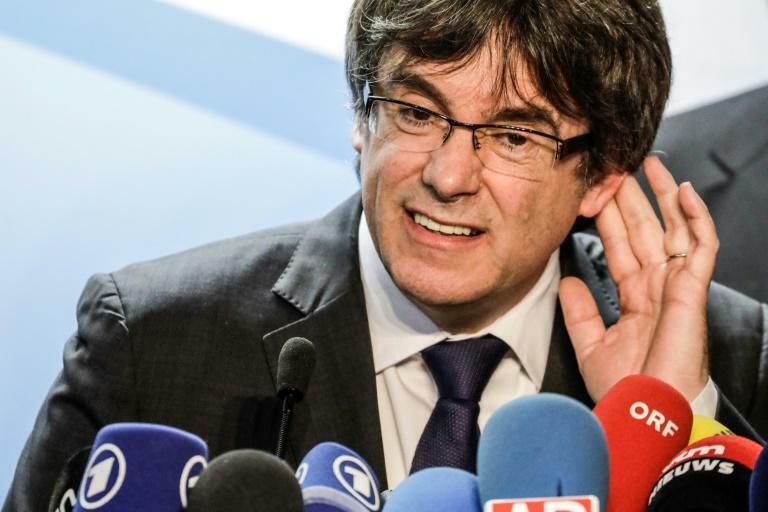 Catalonia's ex-leader Carles Puigdemont, currently exiled in Brussels after a failed independence bid, faces arrest if he returns home despite having parliamentary immunity, Spanish prosecutors said Saturday. Puigdemont, who fled to Belgium in late October after Madrid sacked his cabinet over their breakaway attempt, is eyeing a return to power after scoring big in regional elections in December. But back at home, he risks being detained on charges of rebellion, sedition and misuse of public funds. Several other separatist lawmakers are already in custody in Spain over their role in the regional parliament unilaterally declaring independence on October 27. "It's inadmissible that the privilege of parliamentary immunity should be interpreted as impunity," the office of Spain's general prosecutor said in a statement. "The guarantee of immunity does not mean that we can't place him in custody on a court order," the statement said. "By running away and supporting acts which culminated in the declaration of independence, (Puigdemont) shows that he persists in his criminal plan." Prosecutors also pointed to the separatist leaders already behind bars, saying they were also detained despite their parliamentary immunity because of the "extreme gravity" of the facts. Earlier this month, the Supreme Court had decided not to free former Catalan vice president Oriol Junqueras, in custody since November 2. Judges said there was a risk he would "re-offend as there is no sign that the defendant has any intention of abandoning the route he has followed until now". Junqueras and Puigdemont were instrumental in Catalonia's push to break away from Spain via a referendum that took place on October 1 despite a court ban. In a major blow to the central government in Madrid, pro-independence parties won an absolute majority in regional elections on December 21. As the sole candidate from Catalonia's separatist grouping, Puigdemont announced this week that he could govern the region from Brussels if he is re-elected president. The parliamentary vote to choose a new Catalan leader is due to take place by the end of January. But Spanish Prime Minister Mariano Rajoy reiterated Saturday that governing Catalonia from abroad would be "illegal". Echoing remarks he made Monday, Rajoy said Madrid would maintain its direct control over Catalonia and will take the matter to court if Puigdemont sought remote rule. The Catalan parliament's legal experts say any presidential contender has to be physically present, but Puigdemont insists he has the legitimate mandate of the people to rule. He wants to present his candidacy and government programme to parliament -- a prerequisite to being voted in -- remotely via videolink or by having someone else read it for him. His lawyer Jaume Alonso-Cuevillas said Saturday all scenarios were currently being considered. "President Puigdemont never dismissed the possibility of presenting and submitting his candidacy in person," the lawyer told Catalonian public television, adding that his client was "aware of the risks he faces". Alonso-Cuevillas has previously said that Puigdemont "could not be arrested" in Barcelona because of his immunity.